Safari 3.0 the Apple browser, built on the WebKit rendering engine, is now available in Public Beta … and for Windows too! I can’t ever see it becoming my #1 browser, but it’s great news for us web developer-type bods who don’t have ready access to an Apple Mac — or the Linux Konqueror browser — for testing. Download Safari 3 Public Beta today. 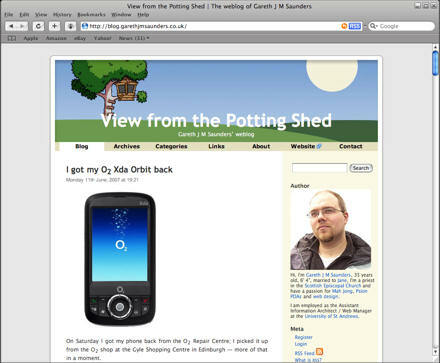 On Saturday I got my phone back from the O2 Repair Centre; I picked it up from the O2 shop at the Gyle Shopping Centre in Edinburgh — more of that in a moment. Thank you for sending your mobile phone to us. Is that supposed to fill me with confidence? Is this an out-of-the-ordinary action for them? Do they usually just hand them to sixth-form school kids on work-experience to tinker with? … and we are pleased to tell you that the reported fault has been identified and the necessary repair has been successfully completed. Hoorah! I wasn’t going mad, there was something wrong with it. I wish they’d said what it was. I’m curious like that. We have also taken the opportunity of installing the latest O2 approved manufacturer’s software which corrects any known faults in the original software. 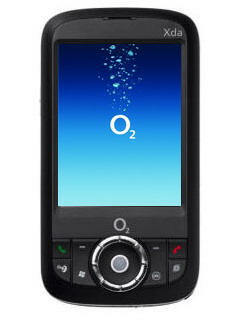 If you experience any further difficulties with your phone, then please return to your nearest O2 store. Now, I’m sure that my nearest O2 store is probably in Dundee, but since we’re more often in Edinburgh that’s the one that we regard as our nearest; and the Gyle Shopping Centre is closer to the Forth Road Bridge than Princes Street. But I’ve yet to be served there by someone that I could truly regard as helpful. Saturday’s assistant was a trainee called John, who muttered and mumbled and spoke so quickly I had to ask him to repeat himself on more than one occasion. When he returned from the back room with my repaired phone, I tried to engage him in a little conversation; a little banter, you know, to try to draw out some genuine and authentic communication. 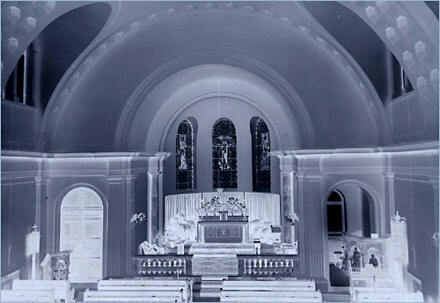 It would probably help while reading the following if you mutter Trainee John’s remarks. Me: Did they say what the matter was? Trainee John: No. They just say that it’s fixed. Me: Oh, that’s a shame. It’s strange, because every review I read about it said that it’s a great phone. Trainee John: I don’t recommend it. Trainee John: I just don’t like it. I think it’s rubbish, and I don’t recommend phones that I don’t like. Me: Okay … that’s one approach, I suppose. Trainee John: I just don’t like it. Me: So … you’re saying that I’ve got a terrible taste in phones. I can’t say that I was particularly impressed by his sales manner. When I got the phone home I discovered that the casing hadn’t been replaced properly; nothing that a good firm squeeze didn’t fix. It certainly appears to be working quicker than before. Only time will tell, I suppose. And then I can write that review, eventually. Ach well, the dream was good while it lasted. Remember that post last week about my doing Sunday cover during the summer in little ol’ Monte Carlo? And remember that I phoned and offered which Sundays I could do, and was told that that was fine and he’d phone back on Thursday with details? Well, I found out today that I’m not going. It turns out that when he said “yes those Sundays are fine” what he actually meant was “I’m sorry but those Sundays have already been booked by someone else”. I’m somewhat disappointed, if the truth be told. But at the same time, oddly, not at all surprised! So I have now booked holiday time from work at the most expensive time of the year … and have nowhere to go. Yet. However, it will be good to share my holiday with the lovely Jane; our first proper holiday together in about two years! And that has to be a good thing, no matter where we go.